Living in Coventry I’ve visited the Coventry Transport Museum a few times. My last visit was only last year, but with the posters promising that the refurbishment would be complete in the "New Year", I went again this weekend. Unfortunately despite waiting until a month and a half into the new year the museum is still some way of being finished. I did speak a member of staff, and it looks like they are now planning for it to be completed around Easter time. There are a number of sections that are closed including the Blitz, the motorcycles and a section containing the prototype cars and some features on car design. Some of these are elsewhere in the museum, put wherever space was available. The only new feature that is now complete is the cycle exhibition. The new cycle exhibition includes a selection of old and modern bikes, and a few hands on exhibits on pneumatic tyres, different styles of bikes and some computer cycling games. 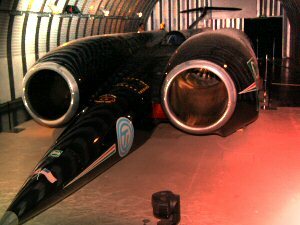 One of the main exhibits of museum is Thrust and Thrust SSC. Thrust SSC (Supersonic Car) was the first car to go faster than the speed of sound. The exhibition includes the original trailer used as the command and control centre, a simulator ride, a very short clip of the car travelling across the dessert and then the car itself, which is introduced by a light display. Although it only takes a few minutes to go through the exhibit it was worth a visit for this alone. If you are looking at visiting then if possible I’d suggest waiting until after Easter 2006, but if you aren’t able to choose when to visit then it’s still worth visiting now. After the refurbishment the museum will include a new and improved Blitz exhibit (one of the best features of the museum, before they started the refurbishment), an additional floor housing the motorbikes and a new double decker bus exhibition. There will also be a dedicated area for the model cars, although I don’t believe that will be finished at the same time. The Transport Museum tells a really good story, not just about transport, but also about the industry in and around Coventry. It includes a large collection of cars, and (in my opinion) has the potential to be far better than the museums at Gaydon and Beaulieu when they finally finish the refurbishment. All this and it’s free. No charge is made for admission. You can go without it costing anything, although they do suggest that buying a museum catalogue would help fund the museum. When I went they gave a free Thrust SSC CD-ROM when you bought the catalogue. They also have a lot of other reasonably priced items in the museum shop. The catalogue is a good book to keep as although it includes a lot from the museum it also reads well as a standalone book on the history of British transport. The CD-ROM would be a little disappointing if I’d paid a lot of money for it, but as a freebie it is quite good. It does have some good photos of the SSC in the dessert, but the videos are all of very poor quality (a reflection of the state of the Internet at the time, before the age of broadband). Well worth a visit, and I’m looking forward to going back again after Easter. This entry was posted on Monday, February 13th, 2006 and is filed under Coventry West Midlands, Tourism. You can follow any responses to this entry through the RSS 2.0 feed. Both comments and pings are currently closed.